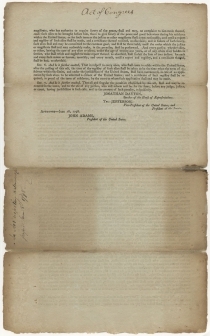 ALIEN AND SEDITION ACTS. [JOHN ADAMS]. Broadsheet. 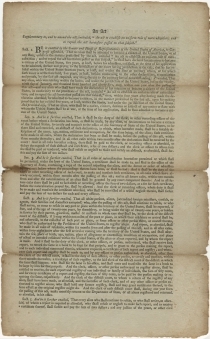 Naturalization Law of 1798. 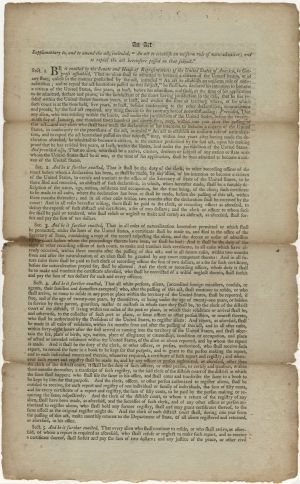 An Act Supplementary to, and to amend the act, intitled, “An Act to establish an uniform rule of naturalization; and to repeal the act heretofore passed on the subject.” [Philadelphia],  2 pp., 8¼ x 13½ in. Docketed on verso. Evans 34700. The purpose of this Act of Congress was to increase the “notice time,” the time period an alien needed to wait before declaring an intent to become a citizen, from 3 to 5 years, and notoriously expanding the residency requirement for American citizenship to 14 years. Treated by a professional paper conservator.